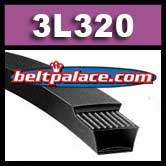 3L320 FHP V-Belt. Consumer Brand. 3/8" W x 32" Overall Length. Standard Duty FHP construction. Grizzly PVM32 Belt or P9972Z0023 Belt for G9972Z Light-Duty Lathe. Gates Truflex 1320, Gates Part 8400-1320.